Editor’s note: Our first post on Fernie, B.C. ran in the summer of 2012. It was action-packed and full of tips (a few of them hair-raising!) for adventure. In collaboration with our friends at Tourism Fernie, we’re going to shine a light on this popular all-season destination – arguably one of Western Canada’s most happenin’ historic towns – with a series of four posts to be produced in an arms-length collaboration and released over the next year. We’re launching this new project with a Q & A featuring Emma Dressler. Who’s Emma, you ask? 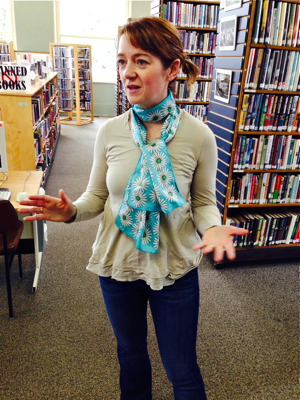 Oh, she’s just a feisty Irish-born, award-winning librarian who happens to run the Fernie Heritage Library. A married mother of three, Dressler also happens to have a HUGE heart for her southeastern BC mountain home. Never – we’ve discovered – underestimate community-loving, small town librarians when you’re on the road. They may well be the most unsung of heroes when it comes to local travel knowledge. T&C: How did you end up in Fernie, B.C.? Emma: I’m from Ireland, by way of Saskatchewan and then Victoria, BC, where I went to university. I ended up in Fernie by following my heart. It’s where my husband found a great job, and it’s where I found my real home. I absolutely love it here. I’ve been here 12 years and I can’t imagine leaving. T&C: Can you describe the overall vibe of your hometown? Emma: The vibe in Fernie is intense, but in a good way. We’re all very busy enjoying ourselves – celebrating life and our surroundings. For example, my family really loves the trails. The town has an elaborate trail system that’s used for mountain biking, hiking and running. In the winter, I love to go snowshoeing on them. After dinner, we’ll often put on our head lamps, grab a Thermos of hot chocolate, bundle up the kids and go snowshoeing. You can’t get more Canadian – traveling like this through the forest on a dark winter’s night. That’s the cool thing about Fernie. Nature is here, right with us. T&C: From what you’re saying, this is one seriously active community. Emma: I think it’s very difficult to not be active in Fernie. An average summer’s day might include an early morning run, a bike ride with the kids, a swim in the river and maybe a wander on the trails. The children actually golf, swim, skate and ski as part of their school day! An average winter’s day might include a snowshoe on the trails and then a ski later on. My kids are in swim club and do triathlons. I run, do yoga and crossfit. I still describe myself as the quintessential non-jock but I think Fernie is changing me. One has to try hard to be ‘non-active’ in this town. T&C: Can you tell us about your favourite places to nosh? Emma: For breakfast, I really enjoy Loaf. I go for the veggie breakfast scrambled eggs and the breads are home-made. As a mother of three, I love to go to Freshies. It’s a great place to spend the morning, drink a latte or an Americano, and catch up on all the ‘goings on’ of town. For lunch, I head to Lunchbox for soup or a smoothie. I love the Hempire Green smoothie which is made up of apple, banana, spinach and ginger. If I’m with a girlfriend, I might head over for a Blues Burger at The Brickhouse Bar & Grill which features live music nightly. The arts scene in this town is vibrant. You could be out every single evening. When chocolate cravings hit? I head to the Beanpod – which is run by an Irish couple who spent time in Italy and learned how to make chocolate and roast their own beans. I like to go there for an affogato – a shot of espresso poured over a scoop of homemade gelato. Yum. For dinner? My favourite place to go right now is definitely Yamagoya. You usually have to wait in line but it’s totally worth it! I love the Tuna Tataki and my children adore the Agedashi Tofu, a deep fried dish. The rolls and sashimi are also amazing and, well, the martinis are great too. Good service. Good food that is always fresh. Overall a warm, friendly place to go. T&C: If someone asks you where they should overnight when they visit Fernie, what do you suggest? Emma: Well, our visitors always stay with us. But there are a few places I’m very confident recommending. Park Place Lodge is very supportive of our community. It’s nicely appointed, clean, and the staff are very friendly. Lizard Creek Lodge on the ski hill – excellent location! And Cinnamon Bear Lodge, which is a small and lovely B&B in town run by a great couple. T&C: Not to stereotype, but you’re a girl! Where do you like to shop? Emma: I love wandering in downtown Fernie. If I’m looking for a new pair of funky shoes or a great new hat, I always head to see Judith at Ghostrider. If I’m looking for something a bit different, then it’s to Freyja – a younger shop with funky Canadian designers. When I feel like seeing beautiful art, I visit my friend Angela Morgan‘s new studio on Main Street. She’s often there and you can watch her or her young students create. I also enjoy the Clawhammer Press. It’s like an old fashioned print shop which also functions as a well curated gallery featuring local artists. One of my favourite places to visit is the book store Polar Peek – you never know what you will stumble upon. Of course, you can never have too many books. T&C: O.K. We have a hunch we know what you’re going to say, but tell us anyway. What’s your favourite Fernie destination? Emma: The Fernie Heritage Library is obviously my favourite place in town. Every day we have free programs for children – from Lego to ukelele classes. Most weeks, we hold evening author readings. In total, we average 300 visits plus a day. We’re located in a gorgeous turn-of-the-century building with a fabulous garden and we have 20 foot high windows that show amazing mountain views. We also offer free daily papers and 80 magazines. If someone’s traveling through town and they want to situate themselves, we want to be there for them – even if it’s to print an airline ticket or confirm a reservation, even if they just want to eat a picnic lunch in our garden. T&C: Finally, it’s fall in Fernie right now. What season do you enjoy most in your corner of Canada? Emma: Fall. I love sweaters and boots. Everything looks beautiful with fall colours, snow on the mountain tops and blue skies. Just last night my family went for a gorgeous bike ride on the trails. It was cool but so clear. Locals scatter in the summer. So during autumn, everyone comes back and the buzz starts. The energy in Fernie is amazing as the town fills up. Permanent residents are back but so are the massive numbers of young people who move to town to ski for the winter. The town is alive! Then winter comes and Fernie is the best sort of wonderland – like a magical snowy playground where everything glistens with potential. Calling all Toque & Canoe readers! Do you have anything to add to our Fernie post? Feel free to comment below. Also, check out The Fernie Heritage Library site for details about upcoming guest speakers featured in ‘Booked! The Fernie Writers’ Series.’ Click here for more info on Emma Dressler’s hometown. *Note to readers: Our four-part Fernie series is sponsored by Tourism Fernie. The agency did not review or approve this article. Great Fernie suggestions! I would add Big Bang Bagels for a quick lunch, and be sure to unwind with a What the Huck ale from Fernie Brewing Company — yum! And nothing beats the apres-ski scene at The Griz Bar. I’m gonna add our two favourite breakfast spots: Mugshots and Blue Toque. For a smallish town there’s no shortage of places to ‘nosh’. I’ve never been to Fernie but it is now at the top of my list. As a Torontonian, I am often envious of the seamless way in which my western comrades engage with the outdoors. We do our best here. In fact, last night I was at a fundraiser for Park People (http://www.parkpeople.ca) a nonprofit I chair that is mobilizing local residents to volunteer in their neighbourhood parks). For us, urban parks are our ticket to nature. They’re essential for enjoying and surviving urban life and I love them. But I dream of the way of life that Emma describes…especially the snowshoes and hot chocolate with the family after dinner. Perhaps I’ll try and recreate that here this winter, disregard the skyscrapers on the horizon, and just focus my gaze up to the stars. Julia, please come and visit us, you will love Fernie , not only what Emma stated but just wandering around and taking in the majestic mountains that encircle our town, come and especially go visit the library, Emma really is terrific and as mayor I appreciate all that she does for our town, she and her staff are amazing people and for a small town we offer a lot both for body and soul. this is a great article on Emma and take it from me she is as wonderful as she sounds. hi Julia, you are too kind, please do come and visit and make sure to look me up and I will take you out for lunch at one of those places Emma mentioned, you can see first hand how small towns are wonderful places. Hey there-I’m a snow-chaser and looking for excuses to head west. What’s the cross-country skiing like in the winter months? Fernie was named the ‘Coolest Ski Town in North America’ by Rolling Stone mag! And for what it’s worth… I totally concur. In this thoughtful interview Fernie Heritage librarian Emma Dressler showcases many features of this very special community with a population of nearly 5,000 and swelling by nearly 2,000 in the winter months. I spent more than an hour “clicking” away uncovering suggestions as to accommodations, eateries, activities such as hiking, skiing, swimming and golf, the very interesting Clawhammer Press (hand-set type and letterpress printing – you know, the ways of days gone by) and other art related sites. It was great to be able to visit the website of the talented artist, Angela Morgan. Fernie attracts a plethora of artists – potters, painters and printers….. and musicians too. The Fernie Arts Co-op sounds like a must to visit with its textiles, handmade jewellery, pottery, fine art prints and photography as well as paintings. Polar Peek Books and Treasures and specialty shops will be appreciated by those searching for that special something. Do read about the history and restoration of the magnificent building which houses the Fernie Heritage Library. Great article and I’m sure it will gather considerable traction through social media and word of mouth. I plan on visiting Fernie ….soon! I haven’t been to Fernie in ages, but I remember that I loved it. It just got bumped into top position on my BC trip list. Thanks for a great post (It didn’t hurt that I LOVE libraries/bookstores and coffee shops). Read the section on Fernie while at the library gazing at the mountains. I Hope the link works. “After dinner, we’ll often put on our head lamps, grab a Thermos of hot chocolate, bundle up the kids and go snowshoeing.” This description brought back a favourite memory of the town I felt first at home in, Montreal. As students in residence at McGill, we used to put on headlights and cross-country ski up the mountain and sip cocoa at the top while taking in the view of the blanketed city. Now that I’m older, I am drawn to smaller towns with visual appeal and Fernie definitely fits the bill. Thanks for sharing your town.